UC Berkeley’s graduate students have long been underrepresented — pushed away from student government for decades, denied adequate financial resources and structured to rely on the ASUC. After a history of contentious relations spanning back to the 1960s, the Graduate Assembly, or the GA, is considering separating from the ASUC. 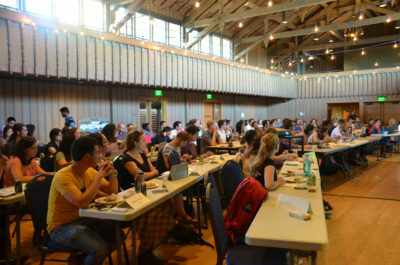 When the GA was formed as a subsidiary body to the ASUC in 1969, it was described as an act of student solidarity between undergraduate and graduate students. But over time, the GA began to feel disenfranchised in this relationship. “In practice, today, the ASUC speaks and advocates exclusively for the undergraduate student body while claiming to represent all students at Berkeley,” according to a GA document distributed at the GA special delegate meeting Feb. 15. 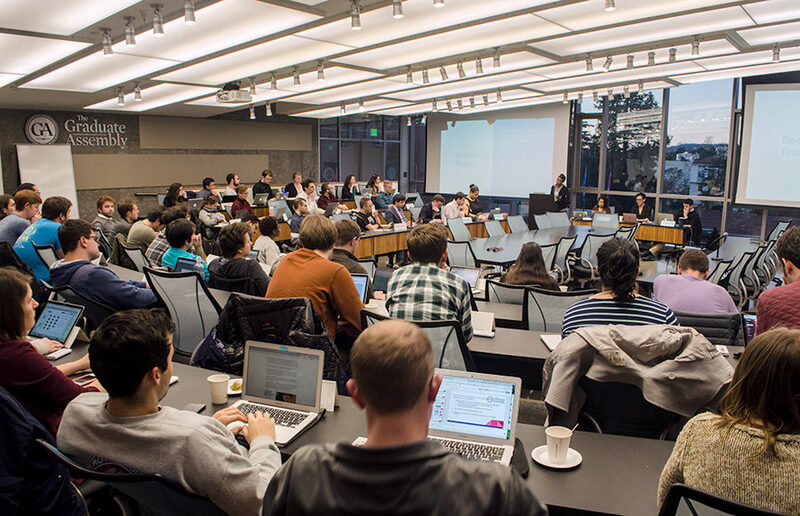 Both parties debated the GA’s future with, or without, the ASUC at the meeting. The GA’s governance workgroup presented a proposal that would dissolve the GA as a subsidiary body of the ASUC and form an independent nonprofit corporation. In contrast, ASUC President Zaynab AbdulQadir-Morris presented a restructural proposal, as an alternative to separation. The GA and ASUC have had contentious relations for almost half a century. Before the establishment of the GA in 1969, graduate students were not elected as ASUC senators nor formally involved in the ASUC as their own official body. Because graduate students such as Mario Savio were the face of the Free Speech Movement, some campus administrators in the late 1960s believed that graduate students were “rabble-rousers,” said GA President Kena Hazelwood-Carter. To prevent graduate students from spreading “radical” activity to undergraduates, campus officials excluded graduate students from the ASUC, according to GA’s historical archive. Despite protests from then-Chancellor Roger Heyns, graduate students were elected as ASUC officers in 1967. In response, the administration cut all funds from the ASUC and formed a separate organization replacing the ASUC, a Union Program and Facilities Board with delegates chosen by the chancellor. When Heyns reversed his position in 1969 and the ASUC regained student funds, Graduate Division Dean Sanford Elberg suggested creating a graduate student advisory council in the ASUC to provide a graduate student input. Instead of an advisory council, graduate students voted to form the GA. The GA has historically struggled to receive funds proportionate to graduate students’ contribution to the ASUC budget, according to GA internal vice president Jamie Lincoff. In the 1973-74 academic year, graduate students contributed more than $200,000 to the ASUC in student fees, but the GA’s budget was about $10,000. The next year, the ASUC denied the GA’s request for a $55,000 budget and instead allocated a budget of $10,000. In March 1972, the ASUC Senate passed a resolution to defund the GA’s newsletter, the Gadfly, if the publication was used as a political tool supporting issues against the ASUC. Although the resolution was vetoed, Hazelwood-Carter said the GA felt censored. Echoes of this financial tension remain. Over the past 15 years, about $500,000 of graduate student fees have not made their way to the GA, according to Hazelwood-Carter. She said the GA is working with the campus to understand the reason behind the loss. “(We) believe it would not have happened if we were our own fiduciaries and received all funding due to us directly,” Hazelwood-Carter said in an email. Graduate students comprise 27 percent of UC Berkeley’s campus population, but they receive about 4 percent of the campus’s total budget, according to expense estimates from the Office of the Vice Chancellor of Finance’s 2017-18 financial outlook. As it currently stands, graduate students can run for positions in the ASUC, but they do not typically do so because of the substantial time commitment and lack of opportunities to learn about the ASUC and its internal mechanisms before launching campaigns. Hazelwood-Carter added, however, that if GA is to secede, graduate students would not seek engagement in the ASUC as representatives. Graduate student frustrations are not unique to UC Berkeley. 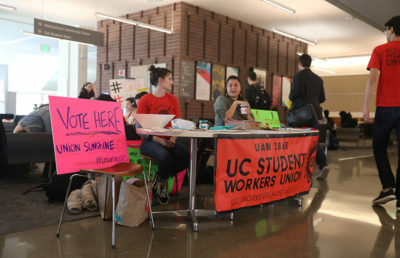 Last fall, graduate student representatives from 10 UC campuses, known as the UC Graduate-Professional Coalition, voted to split from the UC Student Association and pursue advocacy independently. Graduate student representatives argued that the UCSA, a coalition representing UC students to the UC Board of Regents and the government, was inadequately representing them. Rigel Robinson, ASUC external affairs vice president and UCSA University Affairs Committee chair, said in an email that the now-independent graduate student coalition has since visited UCSA meetings to ask for input. “Graduate advocacy is crucial … though we seem to be experiencing issues now that wouldn’t exist if certain graduate associations hadn’t left UCSA,” Robinson said in an email. After the split at the higher level of UC student government, UC Berkeley’s GA raised several “pain points” to the ASUC that it emphasized needed addressing through restructuring or separation. The graduate students want greater financial control over drafting student fee referendum and distributing ASUC funds, claiming that fees collected from graduate students are rarely used for them. They are also advocating for increased access to student union spaces and independent legal counsel. But Hazelwood-Carter said the lack of productive dialogue with the ASUC, despite the assembly’s attempts, has given the GA no choice but to discuss separation. GA delegates voted to explore the option of independence and started the process of forming a 501(c)(3) nonprofit organization in October 2017. The GA also addressed secession during their first meeting of the semester Feb. 5. At the special meeting, AbdulQadir-Morris proposed a model that would add joint financial and fiduciary boards between the GA and ASUC, as well as more authority for the GA on space allocations in the ASUC Student Union. The proposal, which would require an ASUC constitutional amendment, would also include a “checks and balance” mechanism for the ASUC to ensure the body is representing all students. Separation, AbdulQadir-Morris argued at the meeting, threatens more than 130 years of ASUC autonomy from campus administration, fracturing their strength in numbers. “We believe that schisming is an irresponsible action to move forward,” AbdulQadir-Morris said at the meeting. But GA delegate Adam Orford said at the meeting that ASUC’s plan is uncertain and that separation is a more viable, immediate solution. Delegates will continue discussion over the merits of both separation and restructuring. The vote on the resolution to separate from the ASUC will be held April 5.